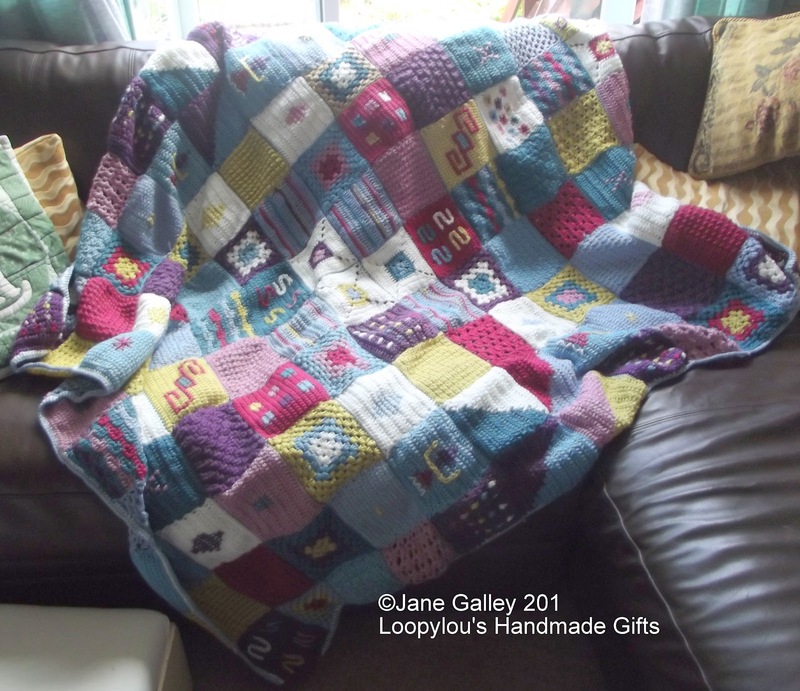 Loopy Lou's Adventures Into Handicrafts: One Hundred and Twenty! and washed, ready to use. As it's not quite cold enough to use yet, I have it hanging over the radiator so I can enjoy seeing the fruits of my labour over two and a bit years. Over that time, I've learned the different stitches, how to read a pattern, and I've actually made useable items. I am looking forward to perfecting my skills with other projects in the future. That is so beautiful! I had no idea that using so many different squares would look that good in a finish. Should keep you really warm and looking good this winter! It is beautiful and that is a lot of blocks. You have done a marvellous job. It is a really lovely sampler. What a job! I have to say I did not like all your blocks individually, but together it looks fantastic. Wow 120 blocks. Great Eye Candy. Congratulations Jane. Your afghan is beautiful. You've done an amazing job and the colours are lovely. I am not ususally a big fan of afghans but this is so wonderful....good for you! Well worth the effort. And I suspect, as you live in the north too, that you won't have to wait too long to snuggle down under it. You'll appreciate this work of art soon enough! It's beautiful.